I quickly noticed that this is amounting to quite a lot of time spent doing the unzip and the writing to disk. What to do???? What about disk speed? Yeah, this is likely to be a part of the total time. The servers that run the symbols.mozilla.org service runs on AWS EC2 c4.large . This only has EBS (Elastic Block Storage). However, AWS EC2 c3.large looks interesting since it's using SSD disks. That's probably a lot faster. Right? Note! For context, the kind of .zip files I'm dealing with contain many small files and often 1-2 really large ones. I create two EC2 nodes to experiment on. One c3.large and one c4.large. Both running Ubuntu 16.04. What the heck!? The SSD based instance is 23% slower! I ran it a bunch of times and the average and median numbers are steady. c4.large is faster than c3.large at unzipping large blobs to disk. So much for that SSD! It's highly likely that the unzipping work is CPU bound and that most of those, for example, 5 seconds is spent unzipping and only a small margin is the time it takes to write to disk. If the unzipping CPU work is the dominant "time consumer" why is there a difference at all?! Or, is the "compute power" the difference between c3 and c4 and disk writes immaterial? For the record, this test clearly demonstrates that the locally mounted SSD drive is 600% faster than ESB. Let's try again. But instead of using c4.large and c3.large, let's use the beefier c4.4xlarge and c3.4xlarge. Both have 16 vCPUs. What's going on!? The time it takes to unzip and write to disk is, on average, the same for c3.large as c3.4xlarge! I need a break. As mentioned above, the unzip command line program is not any better than doing it in Python. But Go is faster right? Right? Please first accept that I'm not a Go programmer even though I can use it to build stuff but really my experience level is quite shallow. So... Go is, on average, 40% slower than Python in this scenario. Did not expect that. I thought this would be a lot clearer and more obvious. Yeah, I know it's crazy to measure two things at the same time (unzip and disk write) but the whole thing started with a very realistic problem that I'm trying to solve. The ultimate question was; will the performance benefit from us moving the web servers from AWS EC2 c4.large to c3.large and I think the answer is no. I ran it a few times to make sure the numbers are stable. They are. This is on the c4.4xlarge. So, the improvement of writing to /dev/null instead of the ESB /tmp is 15%. Kinda goes to show how much of the total time is spent reading the ZipInfo file object. For the record, the same comparison on the c3.4xlarge was 30% improvement when using /dev/null. Also for the record, if I replace that line shutil.copyfileobj(source, target) above with pass, the average speed goes from 159.2MB/s to 112.8GB/s but that's not a real value of any kind. "3.0 GHz Intel Xeon Platinum processors with new Intel Advanced Vector Extension 512 (AVX-512) instruction set"
So that is, on average, 10% faster than c4.4xlarge. Is it 10% more expensive? For a 1-year reserved instance, it's $0.796 versus $0.68 respectively. I.e. 15% more expensive. In other words, in this context it's 15% more $$$ for 10% more processing power. I can almost not believe it! Thanks you Oliver who discovered (see comment below) a blaring mistake in my last conclusion. 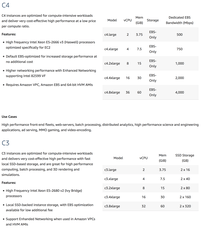 The for reserved instances (which is what we use on my Mozilla production servers) the c5.4xlarge is actually cheaper than c4.4xlarge. What?! Silly me. I see what you mean. I was on my mobile, tired, when you read that. By the way, see the (second) update above about using c5 instead. Rule of thumb: newer instance types are generally faster. Try C5 instance. Looks like Python script can't use all cores and you just benchmarking single core performance. See my (second) update about using c5. So looking at http://www.cpu-world.com/Compare/416/Intel_Xeon_E5-2666_v3_vs_Intel_Xeon_E5-2680_v2.html the processor in the c4 is a newer generation, which has CPU speed benefits as Mike Lowe points out, but the potentially more significant points may be the added support for DDR4, if Amazon are taking advantage of this, and the new instructions, if the underlying zip library is able to use them. See (second) update above about the use of c5.4xlarge in comparison to c4.4xlarge. Did you check with vmstat or top or some other tool what the bottleneck seems to be? I did not. How do you suggest I do that? Tips welcome. SSH into the server, run `vmstat 10` (to get an update every 10 seconds), run your benchmark in a different SSH session, then watch vmstat's columns while the benchmark is running. The last few columns show CPU usage: user, system, idle, wait, stolen. Will try next time I'm at work. You should try to put the writer part into a separate thread, because the writer blocks until data is written. If you've 2 separate threads then read and write can run in parallel. At least on the incredibly ugly Windows this helps a lot. Especially on Windows it is necessary to have a pool of writer threads to get at least a speed which is comparable to Linux. So you can't read the data in thread and send it to another. Unless you can do a prototype. "Is it 10% more expensive? For a 1-year reserved instance, it's $0.796 versus $0.68 respectively. I.e. 15% more expensive. In other words, in this context it's 15% more $$$ for 10% more processing power." You are sooo right. It's cheaper to get the faster compute instance. Thanks for sharing nice information i Hope this blog is useful for you. 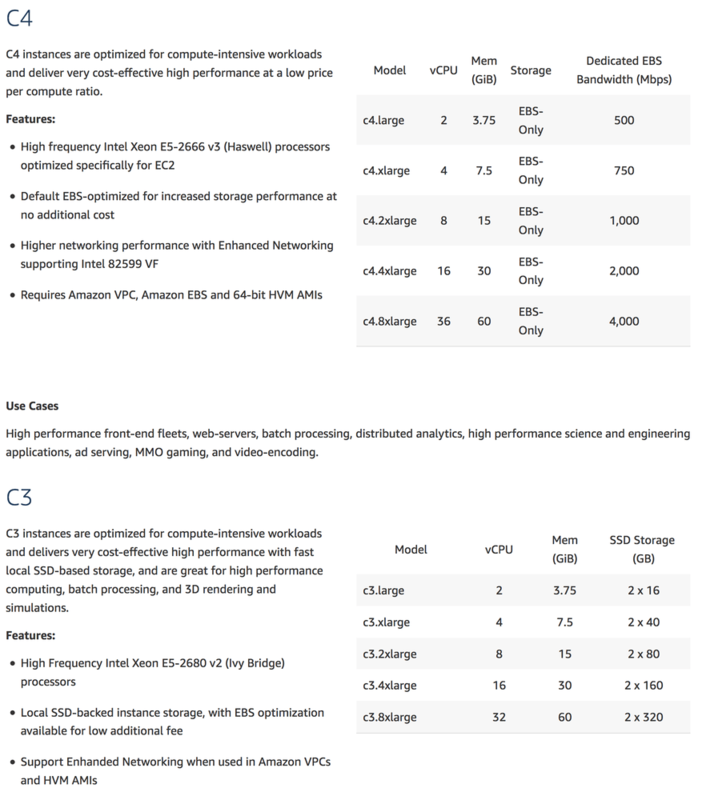 https://mindmajix.com/amazon-ec2-instance-comparison. Nice blog and definetly you will get some more information. Please go through it.